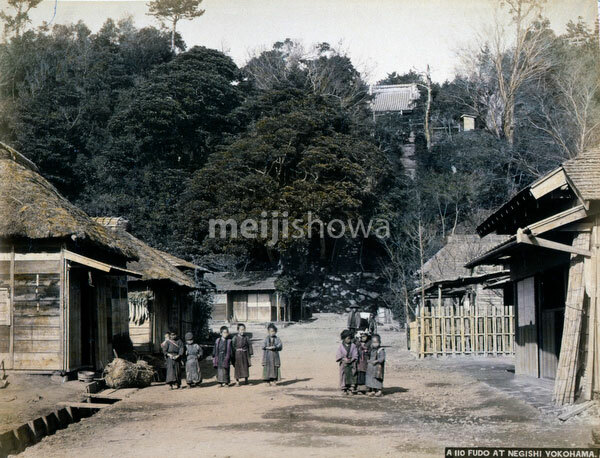 Children on the road to Shiraito Fudoson (白滝不動尊) at Negishi (根岸), Yokohama, Kanagawa Prefecture. The roof of the Hondo (本堂, main hall) can be seen between the trees. When Buddhism and Shintoism were separated (神仏分離) in 1868 (Meiji 1), Shiraito Fudoson was renamed Shirataki-san Fudoin (白滝山不動院).